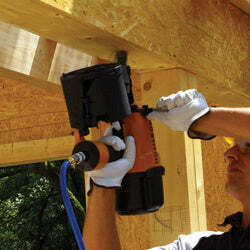 Large coil nailers take the eye this week – not literally……Health and Safety and all that. This nailer, like all nailers is a powerful tool and should be treated with respect – Stanley Bostitch N400C-1-E.
It’s not surprising a large tool with the power capability to get the job done. 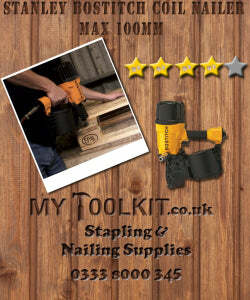 Although it’s got some weight to it, it’s well balanced and has an auxiliary handle so both hands can support the tool. I feel very comfortable when holding it in this manner – holding with one hand does not feel quite right. Short and sweet this week – Be safe and we’ll chat again next time.